Guac and corn chips it is not. Plain-old hummus and pita it’s neither. Just as munchable as either of the above, I’d say definitely, as well as easy to prepare. It’s edamame, or soy beans, cooked and mashed up just like chickpea hummus (minus the tahini), and eggy wonton wrappers baked with a coating of oil and sesame seeds. And — with a little modification — it’s one of the four canapés that will precede the five-course dinner on May 1st, at Queens County Farm Museum. First of all, I should point out that I really didn’t intend for this to come out looking so much like guac and chips. 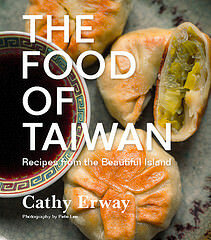 The aim was certainly to make a smooth, tasty dip with the edamame, and crisp, savory chips with the wonton wrappers. It seems that great foods just look alike, sometimes. It took me a little while of backtracking to figure out how the dish came about. It was Akiko, my good friend and Hapa Kitchen collaborator, who suggested edamame hummus in one of the dishes. Deep-fried wonton “crackers” of some sort were proposed at some point as the spreading canvas for a lamb pâté. Then, after the menu got shaken up and mixed around a few times, I went home and cut some wonton wrappers into triangular halves. 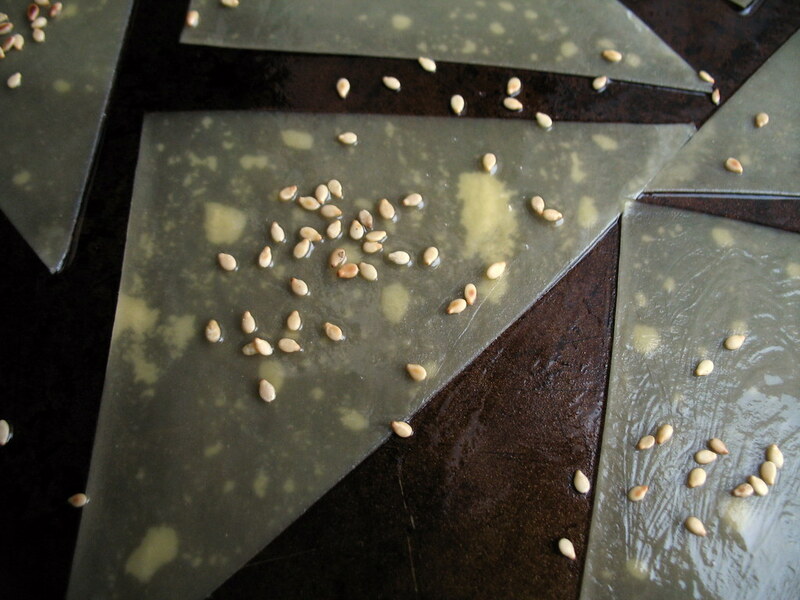 I brushed them with oil and sprinkled toasted sesame seeds on top — just for kicks. A few minutes in a 350-degree oven, and I was pretty flabbergasted when they came out looking and tasting like… chips. It was like the oven had handed them over to an entirely new cuisine, rendered them something they entirely didn’t expect. It made all the more sense then to reach into the freezer and grab a bag of frozen, shelled edamame. After steaming them I dumped the pale green beads into the food processor with some smashed garlic, lemon juice and olive oil. And the rest is history. It was collaborative thinking, mostly, with a little creativity. I can’t wait for more of those Eureka-like food moments to happen by the same means, as I’m sure there will be plenty to come. As for the canapés (not including the one that inspired the recipe below), I’ll leave that a surprise. Please note the above menu is completely susceptible to changes both big and small, but since so many were asking what we’re cookin’, that’s what we’re looking at right now. Tickets are still on sale for the dinner if you’re curious! These wonton chips and edamame hummus are probably the simplest offering of the night, and they make a great snack, a refreshing alternative to blah-brown chickpea hummus. Plus, fresh edamame’s in season! It’s spring, so you should be able to find just-plucked pods at many Greenmarket produce tents soon — which is where we’re sourcing our fresh edamame for the dinner. No idea yet how it will differ from the frozen kind I made here. If you’re searching, frozen bags of edamame are very cheap and ubiquitous in the freezer aisles of Asian grocery stores. Same for the wonton wrappers, in the refrigerated section, however. 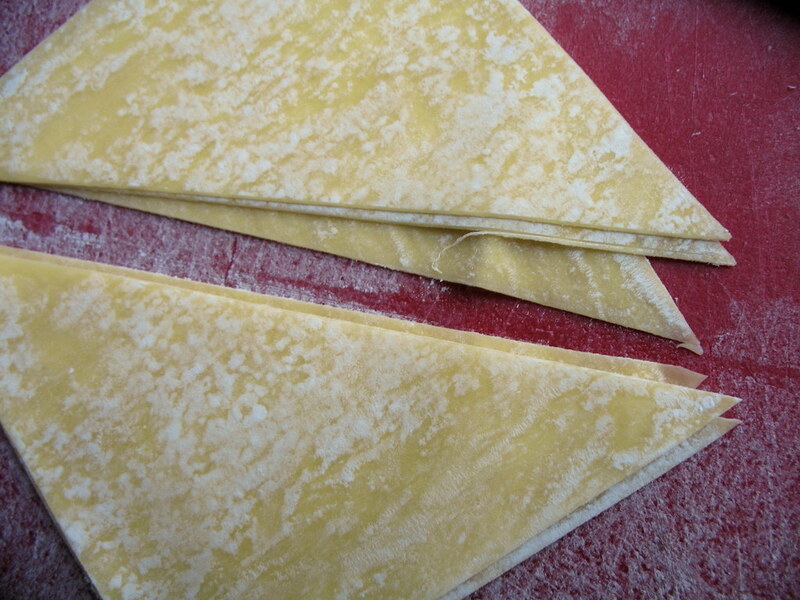 I chose the square wonton wrappers made with egg yolks, which is virtually the same thing as fresh Italian pasta dough. You can tell them apart from the non-egg because of their yellowish hue. Then again, this recipe could be 100% vegan if you opt for the basic noodle dough variety, which are white. To make the chips: Preheat oven to 350 degrees. Lightly coat the bottom of a cookie sheet with about 1 tablespoon of the olive oil. Place the wonton triangles in a single layer on top, and brush the tops with another tablespoon or so of the oil just so that each side is entirely moistened. Sprinkle with the optional sesame seeds. Bake for 5-6 minutes, or until the wonton wrappers have curled at the edges and are just lightly browned. Sprinkle with salt. 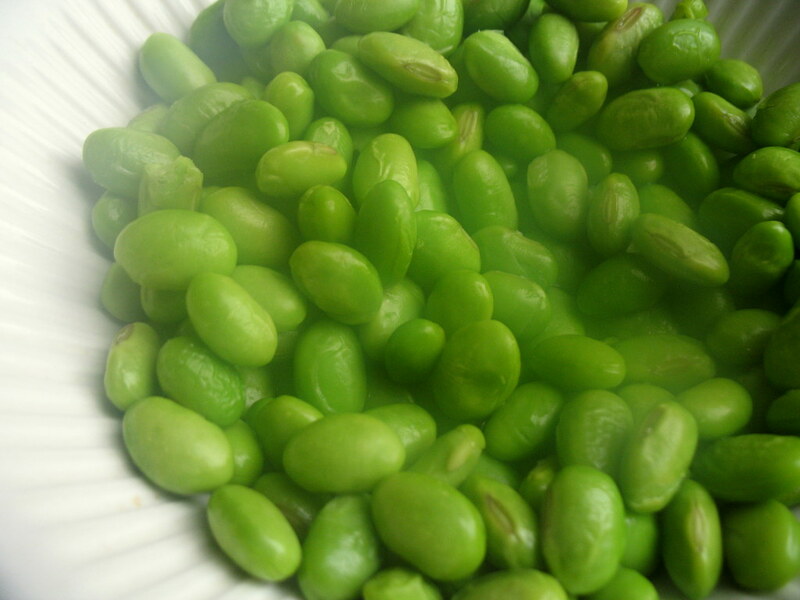 To make the edamame: Place the edamame in a steamer rack (or build a steamer by putting them inside a bowl; place the bowl inside a pot with 1-2 inches of water on the bottom and a lid to hold in the steam). Steam edamame for 8-10 minutes. Remove from heat and let cool. Combine edamame, lemon juice, garlic, and a sprinkle of salt in a blender and pulse several minutes, scraping down the sides of the bowl with a spatula occasionally. Add the water to help bring it to a smoother consistency as needed — adding more or less. Taste for seasoning. Four brownie points: This “other” version of hummus and chips is not only refreshing in flavor, but it’s so healthy it kind of defies our definition of chips with dip. Compared to chickpeas, edamame carries less calories, being less starchy. But it’s still a good source of protein and fiber. Then, I didn’t add any tahini (sesame paste) that’s usually found in large quantities in chickpea hummus, and is a naturally saturated-fatty food. So the edamame hummus above has only heart-healthy olive oil fats in addition to those naturally found in the bean. 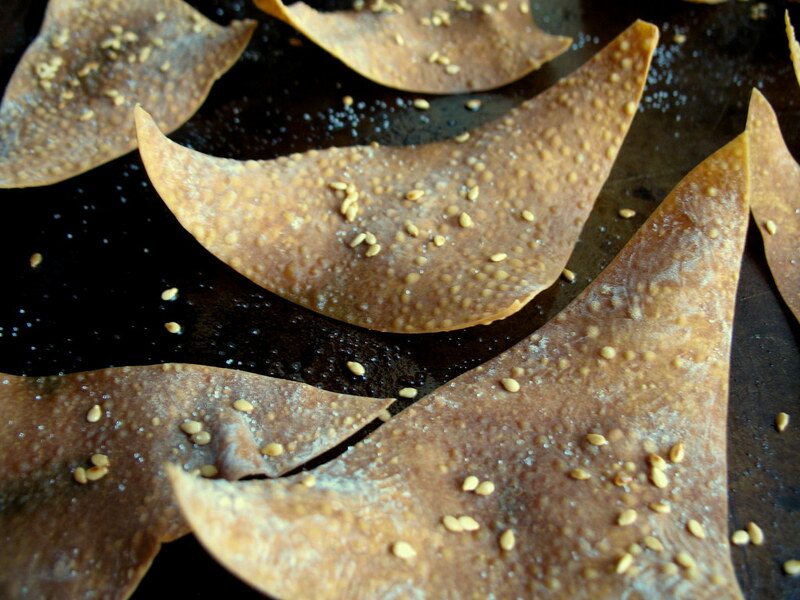 Finally, the crisped wonton chips are “baked, not fried,” and in my opinion, all the better for it. You can really taste the toasted, noodle-like flavor of them, and won’t get your hands covered in grease while eating. 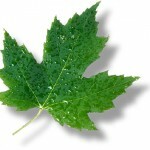 Two maple leaves: Terrible! I have only my excuse that this recipe was a test-run for what will be a really, really green dish at the May Day dinner, with locally grown fresh edamame. The frozen kind I bought are actually not bad in quality, the beans freeze nicely, just like peas, but where they were grown, I have no idea. Maybe Japan. I suppose I could have also made the wonton wrappers from scratch, using local eggs, but these New Jersey-manufactured, Chinatown grocery-purchased premade ones are just so cheap and easy, plus sort of iconic, right? Yum, sounds delicious. Definitely want to try some of this. The May Day menu is sounding scrumptious! Definitely let me know if I can lend a hand with recipe testing or anything else. Oooh! The menu looks crazy good. I love the idea of an edamame hummus, how creative! Edamame are so addicting, so I know it would be super delicious! 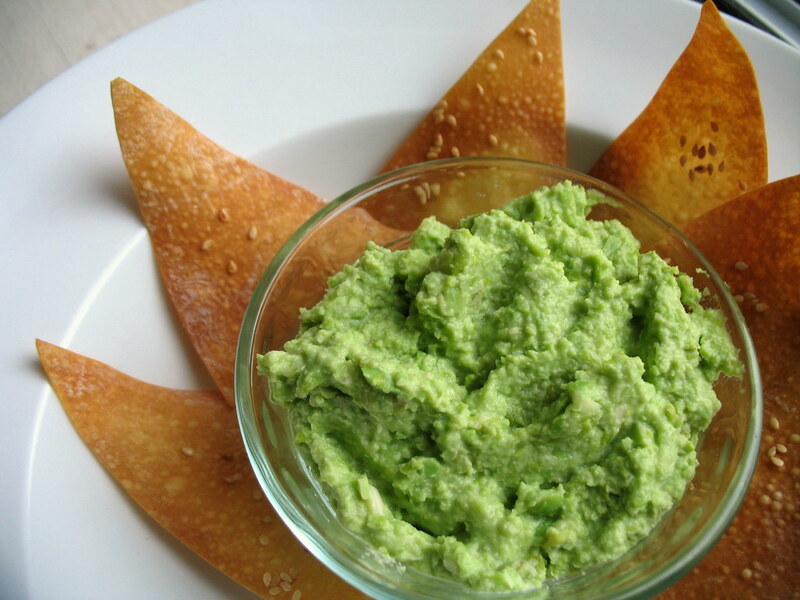 I’ve been wanting to make edamame hummus ever since I saw it on Good Eats, but this just motivates me even more – the wonton chip idea is awesome! Now I know what to bring to my next party. Where can I find edamame that are not from China? All the frozen edamame I’ve ever seen come from China even though the U.S. grows tons of soy. Really like this idea and all the great things you post on this blog. Wishing you and yours a very happy and prosperous new year ! Tried it last night – Guac and corn chips it is not !! What’s up, after reading this awesome paragraph i am also delighted to share my know-how here with colleagues. fashions for little ladies matter, it is hard to beat the boutique clothing advantage. the entire purchase price with her own money. This is because they are too over-shopped and price breaks are not that high. cabinet construction first: stock, semi-custom, or custom. have to be knocked down. Here are the step-by-step instructions for refinishing old appliances in stainless steel paint, a home improvement project for women with old appliances but a modern sense of style.